Great Opportunity to own a spacious six room 1055 Sq. Ft. duplex condominium with a flexible floor plan and access to common hallways on both floors plus an interior spiral staircase in the living room. Boxed rooms allow the unit to be used as a two bedroom with a den / office or three bedroom layout. The lower level vestibule has closets and is large enough to be used as a study. The apartment is freshly painted with refurbished hardwood floors throughout, the upgraded kitchen has stainless steel appliances, granite counter tops and a washer / dryer closet, both bathrooms have been updated, there are new light fixtures, trim work and interior doors throughout . Subletting and small pets are allowed. 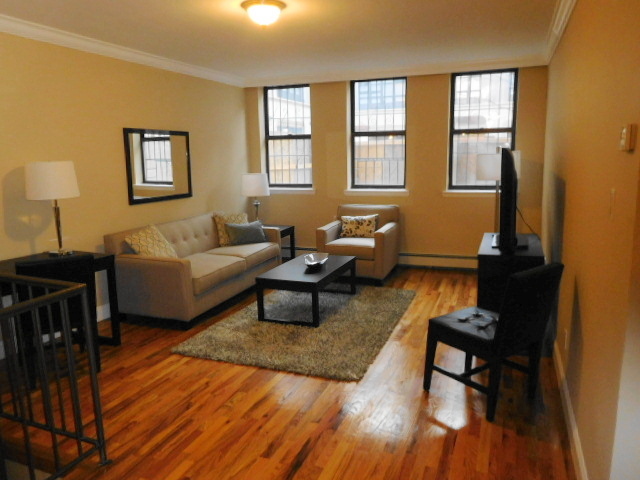 The apartment is conveniently located to all shopping and schools and is 4 blocks from the 103rd Street 4 & 6 Line subway station and 5 blocks to Central Park. The buildings sidewalks & front exterior are presently under construction. The building has a monthly $301.67 capital assessment fee.